To optimise performance in the smart, automated factories typical of Industry 4.0, digital measurement in the heart of the production environment is essential. That’s why Metrios is the future. At the press of a button and touch of a screen, this state-of-the-art, automatic 2D digital optical measuring machine performs accurate and objective part-quality tests directly on the shop floor, thus increasing productivity and reducing costs. It’s the non-contact quality control system that meets the needs of modern production methods, where manufacturers just cannot afford human error and excessive levels of scrap. The speed of the Metrios is what sets it apart. Complex measurements such as distances, angles, radii, diameters and roundness can be taken in just seconds, all with a simple and intuitive click. It’s been designed to measure anything from metal components to deformable materials with ultimate consistency, using in-house software developed to meet each individual user’s requirements. Featuring a multi-touch 17-inch screen designed for crystal-clear visibility and a user-friendly interface, it’s as easy to use as a tablet but as immensely powerful as any measurement tool out there. A sturdy steel alloy frame with reinforcing ribs houses and protects the delicate parts of the machine, allowing it to get to work outside of the constraints of the metrology lab. 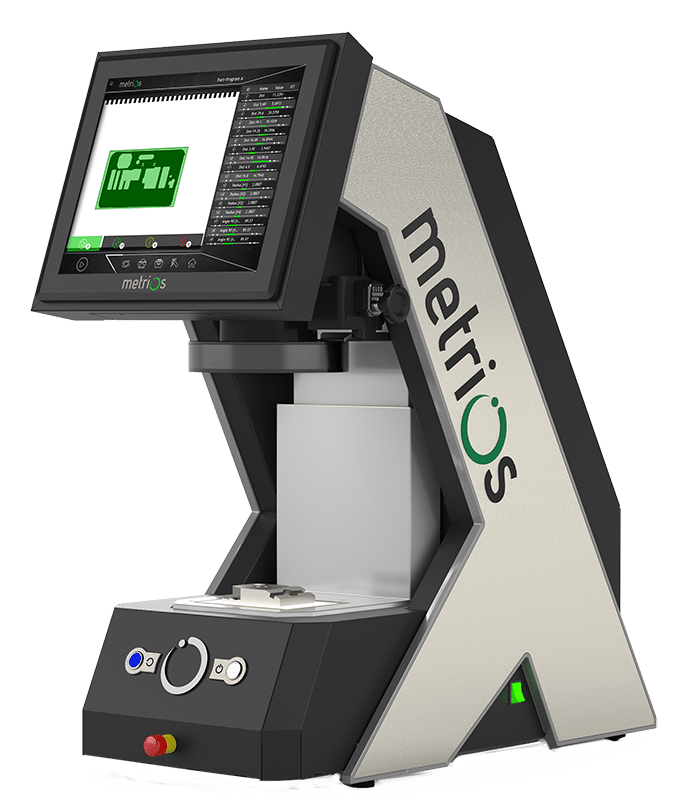 Whether you produce punched parts, laser cut parts, EDM products, plastic stamping products, seals, electric circuits or anything in between, you’ll want to make sure there’s a Metrios 2D digital measurement machine on the mechanical shop floor.